The day we had pencilled in to go on a road trip was not looking at all promising, but we weren’t about to turn back. And you know what? It wasn’t half as bad as expected. We even discovered some real gems - people and landscapes alike. 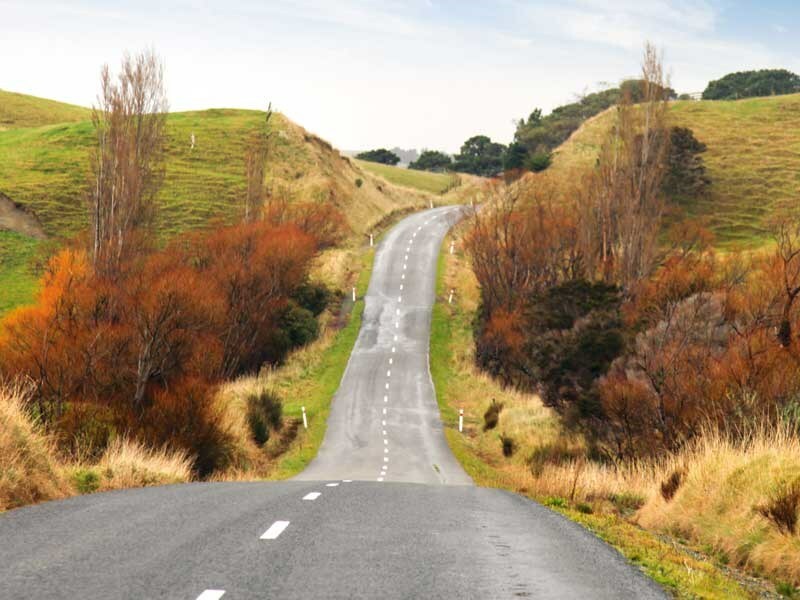 We set off to explore Route 52, which runs roughly between Masterton in the Wairarapa and Porangahau in Hawke’s Bay. Described as a ‘long winding road’ we were keen to check out a route that, although near home, we’d never got around to exploring before. Our destination at the day’s end was Herbertville. The hotel there – under new management – has a reputation for being excellent value: $30 a night per person for accommodation. We hoped that in spite of the low price, it was warm and comfortable. Finding the beginning of Route 52 proved to be like looking for a snake’s tail in the undergrowth – where the heck was it? We had GPS but that ended up disconnected and on the floor as this slightly impatient passenger got quickly irritated with its insistent call to ‘turn left in 500 metres.’ And when using a map on my mobile phone became an exercise in finger fumbling, I resorted to a good old-fashioned map. Except that my map wasn’t detailed enough. Lesson one: never leave home without a decent map. However, getting lost had an upside; we stumbled across an exquisite historic Norwegian style church. 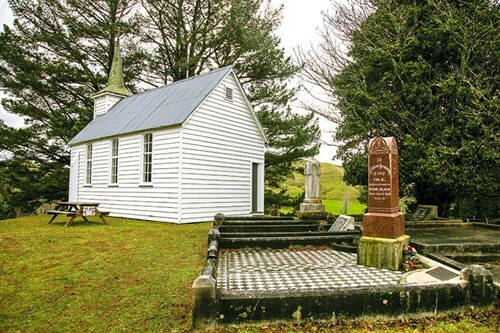 The tiny wooden church, situated on a windswept hill is the North Mauriceville Methodist church and was built in 1881 by Norwegian settlers. Up the winding path we passed gravestones etched with the names of those who worshipped, married, were baptised and farewelled here. The shingled roof and spire is covered in lichen and a distinctive cross with upright points is etched against dark sheltering trees. We stepped inside to learn more about this simple, yet beautiful place of worship. Apparently ‘church services were supported by a well-trained choir of beautiful voices’. The organ, originally played by a Miss Duff of Westport, still holds pride of place today. Leaving the church on its chilly knoll we headed back down the path. After this short sojourn we decided it was best to head back to Ekatahuna then to Alfredton and Route 52. It’s a winding journey alright, but pleasantly so. The road twists and turns through pretty vales. I’m keen to photograph the bright orange winter branches of willow trees that populate the landscape, but rain keeps interfering. The paddocks are full of sopping white sheep and wobbly baby lambs. ‘Why do lambs have to be born in winter?’ I wonder. We felt as if we had the highway to ourselves since we had seen just one other car. But there were plenty of sheep (and one baby goat) on the loose, which made us proceed with more caution. Tiraumea, where there’s only a hall, flashed past in the blink of an eye. 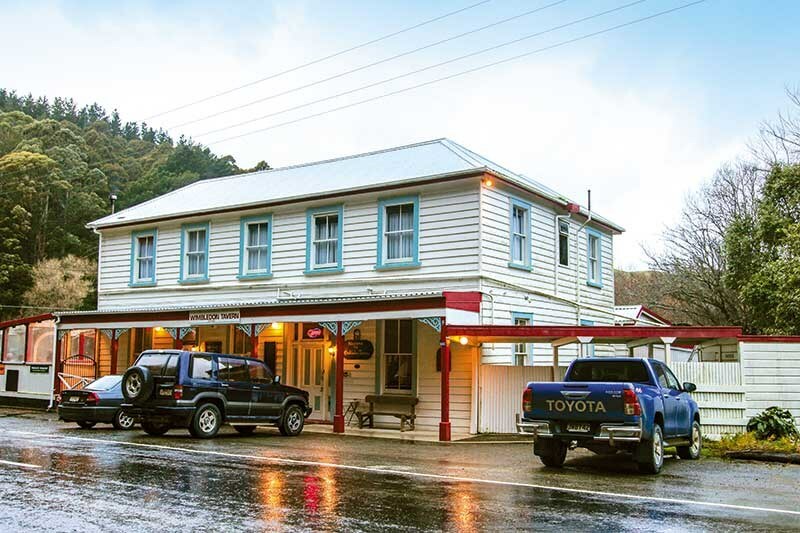 The village of Pongaroa has a hotel that advertises ‘cold beer and great food – country hospitality at its best.’ The Post and Telegraph building, built in 1924 was once a community hub. Luckily, someone loves it enough to have given it a nice coat of paint. 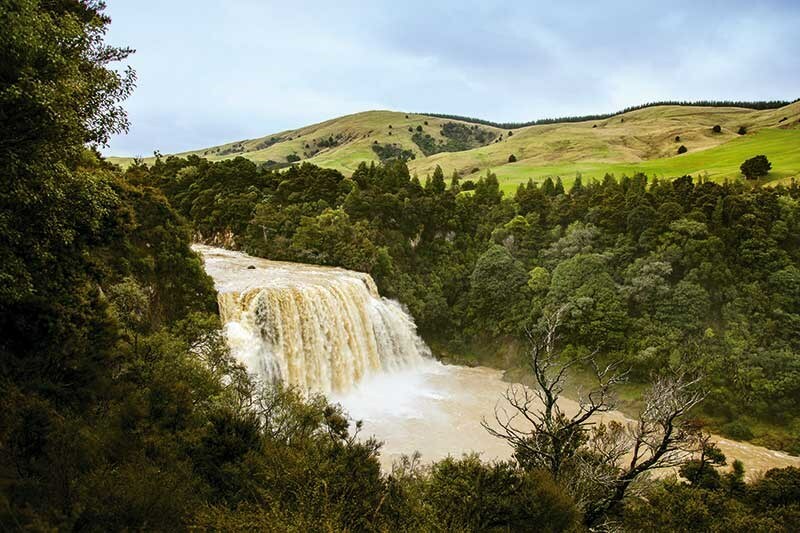 A few kilometres further we turn off to Waihi Falls –this attraction has been recommended, but we have no idea how far it is. After about 20 minutes driving through the back blocks we arrive and see a family group as mad as us, out exploring on this wet day. Actually, there’s something exciting about being out and about when no-one else is. I am not sure why? Perhaps some of my hardy Scottish ancestor’s DNA is seeping up through my bones; the need to have an adventure still exists, however small the journey. It was certainly worth the detour to see torrents of water thundering over the Waihi Falls into the river beneath and creating clouds of spray. Daylight is fading as we get back underway and pass through acres and acres of pine forests that are currently being logged. 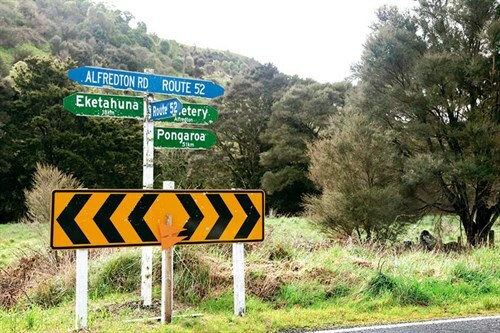 It would be good at this stage to point out that travellers along this route should watch out for logging trucks, as they are working flat out in this area from daylight to dusk. Cars outside the Wimbledon Tavern indicate that the locals were hunkering down for the evening. Whatever the occasion, the tavern has seen 125 years of passers-by and it is still going strong. The Herbertville sign gladdens our hearts as our stomachs are rumbling and we are also keen to stop driving for the day. At the Beach Haven Inn, we battle our way against a bitter wind and stagger through the door. Thankfully, on the other side there’s a glowing fire and a warm welcome from proprietors Lorraine and Ard. That evening we, along with an Italian man called Andreas, are the only guests. 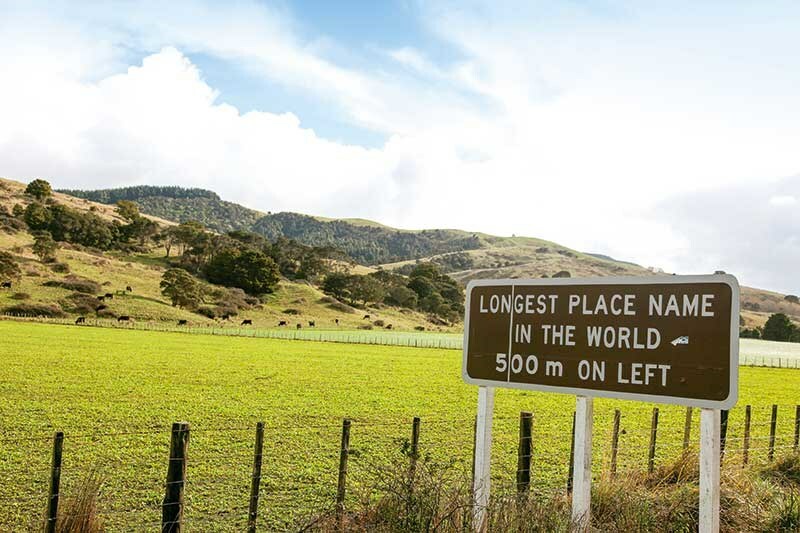 Chatting to Andreas we discover he’s come all the way from Whanganui in his campervan today to check out the longest place name in the country. This is a few kilometres down the road towards the end of Route 52. He wonders at its meaning so I fill him in with in as many details as I know. I mention the Norwegian church explaining, in awe, that it was built in 1881. He very nicely tells me it’s not old in the European sense. No, I guess not, though to us Kiwis it seems so. I ask Ard how he and Lorraine came to settle in Herbertville and he tells me they were looking for a bach to buy and ended up buying the hotel. However, it’s on the market again because Ard, a hydroponics engineer, has other plans. One of these is voluntary work he does in the Solomon Islands, where he teaches people how to grow food hydroponically. 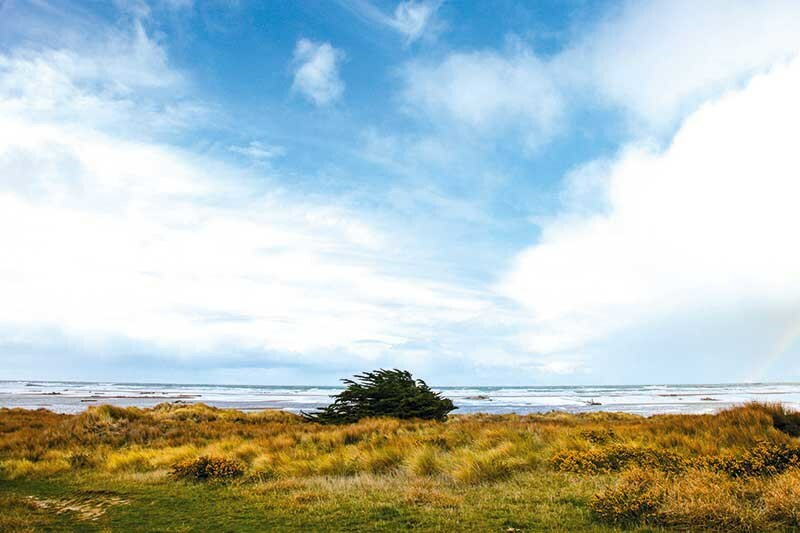 Ard says Herbertville is an excellent place for a holiday with its 12 kilometres of beach; Cape Turnagain (so called because at this point Captain Cook turned and sailed north) where there are seals in winter; good fishing; a nine-hole golf course; and a camping ground. There is freedom parking available at Herbertville too, with permission of the owner who is a local farmer. The next morning I can’t resist firing up the jukebox while Ard cooks us breakfast using eggs from their free-range chickens. We departed as satisfied customers. We reckon it’s the best value this side of the black stump. We spent $150 and that covered accommodation (a truly comfortable bed and a warm room), drinks, dinner and breakfast. Beat that! 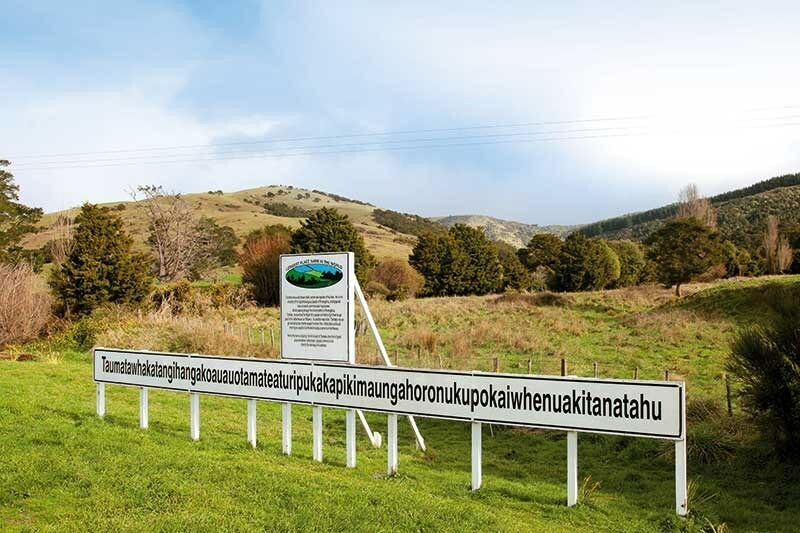 The full stop to our journey was the World’s Longest Place Name – or so they say. It’s a long, skinny sign beside the road in a seemingly unremarkable place. The hill behind here the name translates as ‘The summit where Tamatea, the man with big knees, the slider, climber of mountains, the land-swallower who travelled about, played his nose flute to his loved one’. And that makes an eloquent end to our journey along Route 52.